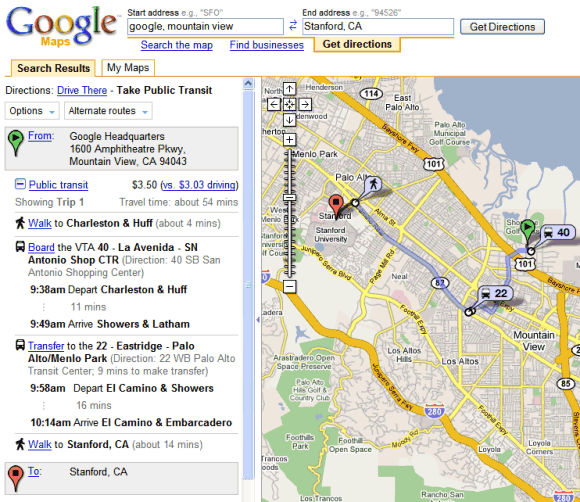 Google Maps integrated the data about public transportation routes previously available at Google Transit. That means you'll have a new option for directions: take public transit. "Google Maps will suggest up to four trips for you to take, which may contain different modes of transportation. For example, one trip may use the train while another uses the bus." You can choose the departure or the arrival time and see estimations for cost and travel time. Unfortunately, the service is only available in a very limited number of US cities (including San Francisco Bay Area, Portland, Dallas, Seattle) and Japan. There are already some very good trip planners like HopStop or Transport for London, but all of them are limited to a city or an area. Google Maps should increase the coverage and make the transit directions available from the mobile phone. Google Transit service coverage is dependent on the participation and cooperation of the local transit agency. Google's ultimate goal must be to leverage the advertising dollars of public transit users. Therefore, they should probably work on incentives and support for their "content providers," who in this case are the transit agencies. Saying google has coverage in the SF Bay Area is quite an exaggeration. It appears that they only support the commuter rail lines at this point, and that is all but useless. If you are a commuter then you don't need google to tell you where the stations are. Bart.gov works just fine if you want to use the bart, it gets complicated when you want to try and transfer to one of the many different bus systems we have here. It provides some good HMI examples and may serve as a benchmark. What a great Idea! I am so excited. Easy add too, just add route information. Will it also display the toll? This is something I have expected ever since using google maps in beta and hearing about the initial API for interfacing the maps. Our local public transit web site is abysmal and could be drastically improved with this sort of service. Public transit mapping and gps bus tracking is something that was in development at my undergraduate college in the late 90's. With tools such as google maps and the vast drop in cost of GPS hardware these are both services that could be provided feasibly to every municipality in the country. I personally feel it would vastly increase the use of public transit. So my question is: How do I go about getting this implemented for my local municipality? I am a programmer and would like to help in any way I can. Along with time and price information, I suggest posting carbon-footprint estimates for travel. That way, people would be aware of the relative environmental costs (in addition to the time and money costs) of their travel. The service should be extended to more cities and countries. This service should also be available to trekkers so that they are aware of the trek they are following.